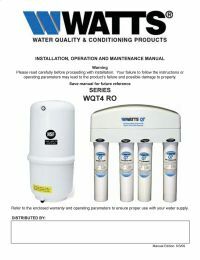 The Watts WQT4RO11 QT Quick Twist RO Annual Replacement Filter Kit is the replacement filter kit for the Watts WQT4RO11-50 Quick Twist RO System. Changing the WQTCBC-10 requires no tools, making filter changes quicker and easier than ever. 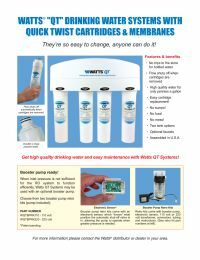 The QT-FILTERKIT contains a sediment prefilter, a carbon prefilter and a carbon postfilter.